Floating debris resulting from heavy rainstorms. Many of us experienced leaky roofs and water in our basements during all of those big May storms, but did you know that those storms also had a major impact on our lakes? 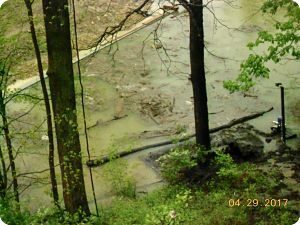 Woody debris from dead trees and private dumping in ravines clogged several of the outflows from our retention ponds and deposited floating debris in the main lake. Sediment from unprotected construction sites and eroding creek beds turned the lake muddy. Fertilizers and pesticides from our lawns washed into the lake along with pet wastes that your neighbor did not pick up from his yard. Yuck! What can you do to minimize these problems in time for the next big rain?